Despite a slight uptick in overall engagement, organizations are in dire need of good managers. Employees are unsatisfied with the amount of recognition and development they’re receiving, despite both being top drivers of engagement. If organizations hope to conquer these, and the many other engagement challenges they’ll face in 2018, they need to leverage managers – and fast. Find out how and more in the eighth annual Employee Engagement Trends Report, our most popular ebook! 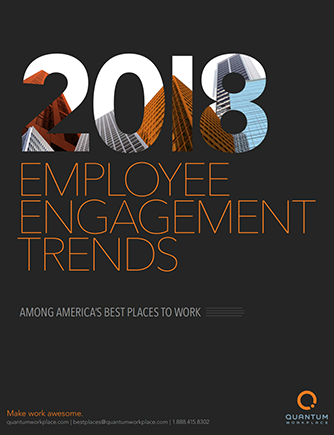 Discover the trends impacting today’s top workplaces in this comprehensive report, examining employee survey data from more than half a million employees across 8,000+ organizations competing in Best Places to Work.